POW! WOW! artists paint for GAX - KUAM.com-KUAM News: On Air. Online. On Demand. It's a movement to engage the community in the creation and appreciation of art. Centered around murals and art, POW! WOW! has grown into a global network of artists and organizes art exhibitions, lecture series, and creative community spaces across the globe. 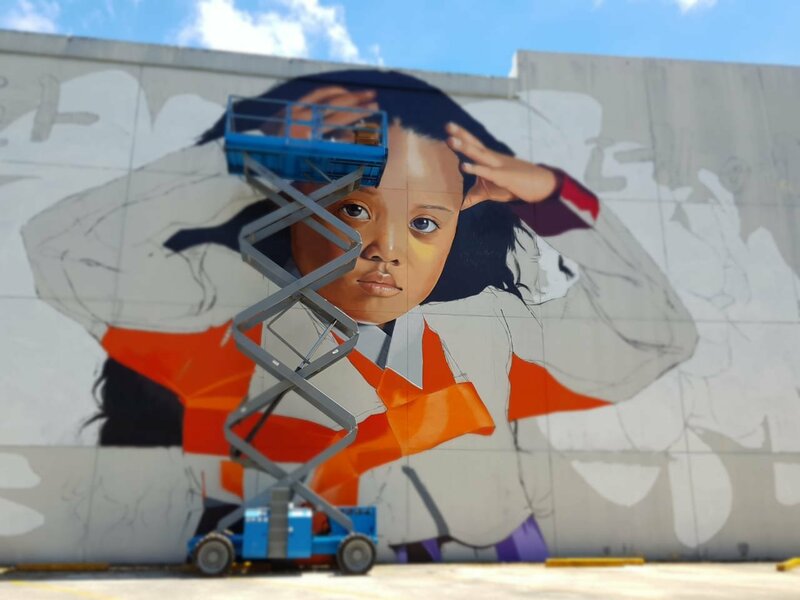 Here on Guam for its second time, it coincides with the Guam Art Exhibit or GAX and this year, the lineup of muralists is amazing. Artist Sheep Chen who is here from Shanghai, China was taking a quick break from working on his mural that's located on the wall of GTA in Hagatna. Chen connected with the organizers after they saw his work on Instagram. He explains how a Chinese story about 8 gods crossing the sea inspired his piece. "They help people to be better. Then one day they wanted to save some people and they needed to cross the sea," he said. "I just wanna express I cross the sea, arrived to Guam and I send my blessings here." As a homegrown and independent art festival, POW! WOW! 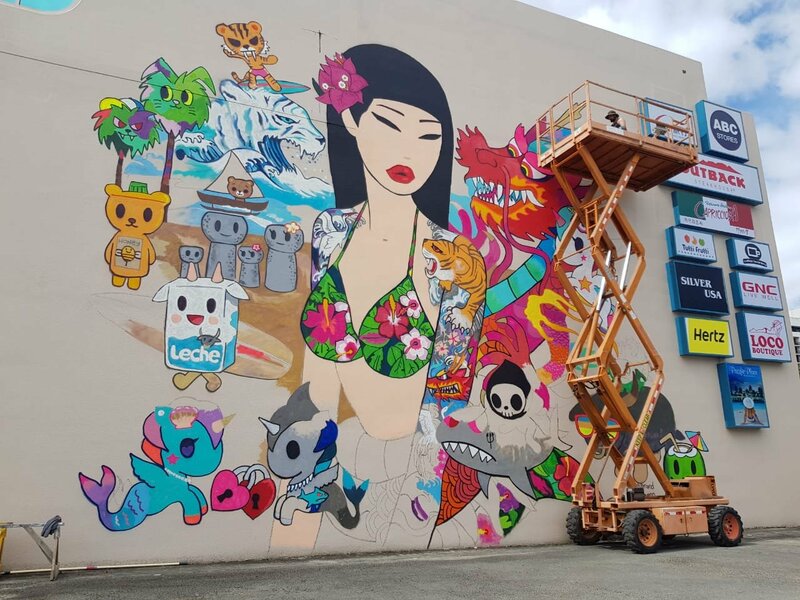 is now recognized as one of the most premier and well-curated mural festivals in the world and the 26-year old joins artists like: Simone Legno of TokiDoki fame, Royyaldog, OneQ, Lauren YS, Caratoes, and local artists Jeff Ejan, Opake, Gino Datuin, and Nina Peck for PowWow Guam. "It's amazing. My roommate is my idol," Chen said. "That's amazing so for me it's an awesome experience." And the island has left a lasting impression on Chen, who wants to come back with his girlfriend. "It's an amazing place. I love it here. People are really friendly and warm," he said. "Every day, they give me a lot of water and say hi. It's really like a family...yes, indeed." Check out GAX, Monday-Friday 6 to 11 p.m. or over the weekend from 11 a.m. to 11 p.m.
And you'll want to make sure you check out the PowWow Guam Block Party taking place tomorrow evening from 6pm-11pm at the Guam Museum. It's a full night of activities including live bands, vendors, beer garden, food trucks, a special art talk from power blogger Jeff Hamada and guest speakers from UOG CIS will host a seed talk on island sustainability. Click here to view a map of the different murals on Guam.